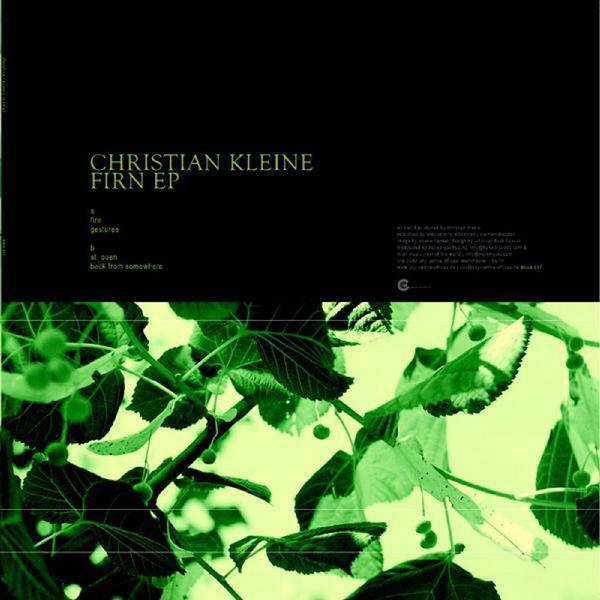 Mr Kleine returns, the most prolific artist at CCO, co-producer of Arovane’s ‘Tides’ album and one half of Herrmann and Kleine, the boy just hasn’t put a foot wrong since the late 90’s and the begining of an electronic and acoustic journey which has culminated in this, his finest release to date. ‘Firn’ opens this 4-tracker with a euphoric tingle, sweeping synths and a pulsating rhythm that could almost attach itself to a disco sensibility if it wasn’t so damn laid back. As ever with Christian’s groove, the tinkle factor is delicately set to its highest level, another deep night anthemic lullaby. ‘Gestures’ is even more introspective and mellow, CK’s signature hip hop beat tweaking itself to its crunchiest form, the melodies sinking in and taking over in the most natural, understated way. Onto the flip and a change of tone, ‘St Ouen’ owes more to the shimmering minimal textures of Pan American than to any IDM preset, a throbbing bass pad looping itself into a reverberating groove, Rhodes keys sparkling in the distance with a haze of smoke and uncertainty. Amazing stuff. ‘Back From Somewhere’, meanwhile, finishes things off with an almost-House groove, breathy emissions enveloping a 4/4 beat, submitting into an altogether more etherial and radiant goodbye. Killer.